It’s no secret that social media is a fundamental part of your digital marketing strategy. It’s free, it gives your brand a presence where potential consumers are already spending a vast amount of their time, and it’s relatively easy to use. You know that you should be using social media to bolster your brand, but the question for many becomes: How often should I be posting to my social media accounts? On the one hand, if you do not post enough, social media users will deem you inactive and unengaged—or forget that you are there altogether. On the other hand, if you post too often, you may become annoying to users, pushing them to unfollow you. Social media posting frequency is critical to pay attention to, but it can be somewhat of a gray area. In reality, there is no one-size-fits-all answer to the posting frequency question. That’s because your social media posting frequency ultimately depends on how many followers you have, and what your ultimate goal is for your social media use. For example, posting to Twitter in double-digit frequencies daily may be effective for a business that has 10,000 followers or more, but it would be overkill for a smaller business with maybe only 1,000 or a couple hundred followers. That being said, your social media posting frequency also depends on whether you want to see more engagement per post or more clicks to your website. For example, if you have a smaller following, and you post twice a day, then your engagement per post will be lower, but your website clicks will be higher. If you post a few times a week, then your engagement per post will be higher, but your website clicks will be lower. Make sense? Despite that social media posting frequency is relative to your individual situation, countless studies have been done on the topic that have led to some generally-accepted ideas about how to optimize posting frequency to realize social media success. We’ve included a few suggestions broken down by social media platform. Facebook. Most studies agree that, if you have a larger following, one post a day is optimal, with a two-post-per-day maximum. For businesses with a smaller following, at least three posts a week is more suitable. According to HubSpot, Facebook pages with fewer than 10,000 followers saw a 50 percent drop in engagement per post if they posted more than once per day. Twitter. Tweets have a shorter shelf life, which leads many people to believe that they should be posting multiple times a day—up to 30 times daily for larger accounts! However, for smaller businesses, that number is just not practical. Again, the rule applies that how often you post depends on whether you are looking to optimize your engagement perp tweet, or generate more total responses. In the case of the former, at least one tweet per day (up to five per day) was found to be suitable. Though you may catch some big brands tweeting in the double digits per day, you have to ask yourself whether spending that much time tweeting could be better spent elsewhere in your digital marketing efforts. Instagram. Some experts suggest that social media posting frequency on Instagram is less about the number of times you post, and more about your posting consistency. If your followers get used to seeing you post three times a day, and then you suddenly stop, this could adversely affect your account. However, if your followers are used to seeing you post a few times a week, and you suddenly start posting three times a day, this could also have an adverse effect. In general, it is recommended that you post to Instagram at least once per day and no more than three times per day. But keep in mind that consistency is key, so you should set a schedule for yourself that you can easily and regularly maintain. LinkedIn: LinkedIn has a lower tolerance for posting than other social media platforms. 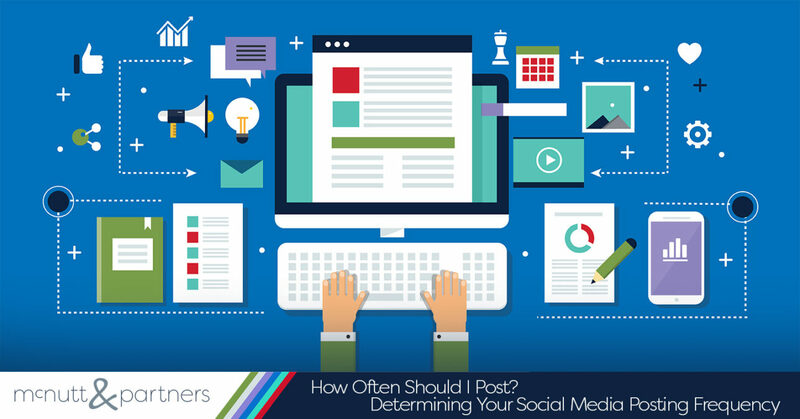 Experts recommend that you should post at least twice a week, posting once per business day is optimal, but you should not post any more frequently than that. According to LinkedIn, posting 20 times per month (about one post per weekday) will give you about a 60 percent audience reach. Google+: Google+ is another platform where consistency makes all the difference. Studies have indicated that you should post to Google+ anywhere from three to 10 times per week. It’s a social media platform that often gets overlooked, but using Google+ for marketing can help expand your consumer reach. Identifying your business’ ideal social media posting frequency may take some trial and error, but the good news is, if you find that something isn’t working to your advantage, you can always change it. The most important thing is maintaining a social media presence at all and engaging with it on a consistent basis. If you don’t have time to set your business’ own social media posting schedule, let the McNutt & Partners team do it for you! Call us today at 334-521-1010 or visit our contact page.